Boeing employees across Washington state will receive incentive bonuses totaling nearly $429 million this month, almost half of the $886 million in bonuses being paid companywide. But despite the record financial results Boeing announced this week, the bonus payments fall short of last year's levels. Boeing employees across Washington state will receive incentive bonuses totaling nearly $429 million this month, almost half of the $886 million in bonuses being paid companywide. But despite the record financial results Boeing announced this week, the bonus payments fall short of last year’s levels. The average payout to all 123,600 eligible employees worldwide is nearly $7,200. The figure includes bonuses for all employees except company executives, who have separate incentive schemes. Boeing declined to say precisely how many state employees are eligible. But with the local workforce standing at just over 69,800 at year-end, with some 8,500 new hires joining and 4,500 others leaving at some point, that total payout means the average here is likely to be around $6,800. The company’s performance-based incentive plans mean bonuses for most employee groups — managers, plus nonunion and unionized white-collar staff — will pay 166 percent of the target payout on Feb. 21. The percentage figure is based on the company’s strong 2018 financial performance, though short of the maximum payout of 200 percent and lower than last year’s figure of 187 percent. Members of the Machinists union are on a separate incentive plan based on measures assessing quality, productivity and safety, all of which were high in 2018. The International Association of Machinists (IAM) incentive plan will pay each union member 5.6 percent of their 2018 annual pay Feb. 28, just shy of the maximum 6 percent possible under the contract. Many of the Machinists will get an extra hefty bonus because they worked a lot of overtime in 2018 to build a record number of airplanes. Still, last year the total Boeing incentive bonus payout was greater, a record in company history. A year ago, the 187-percent-of-target payout to Boeing’s white-collar staff, along with Machinists bonuses equal to 5.5 percent of their total annual pay, resulted in a total of $600 million in bonuses to Washington state employees. 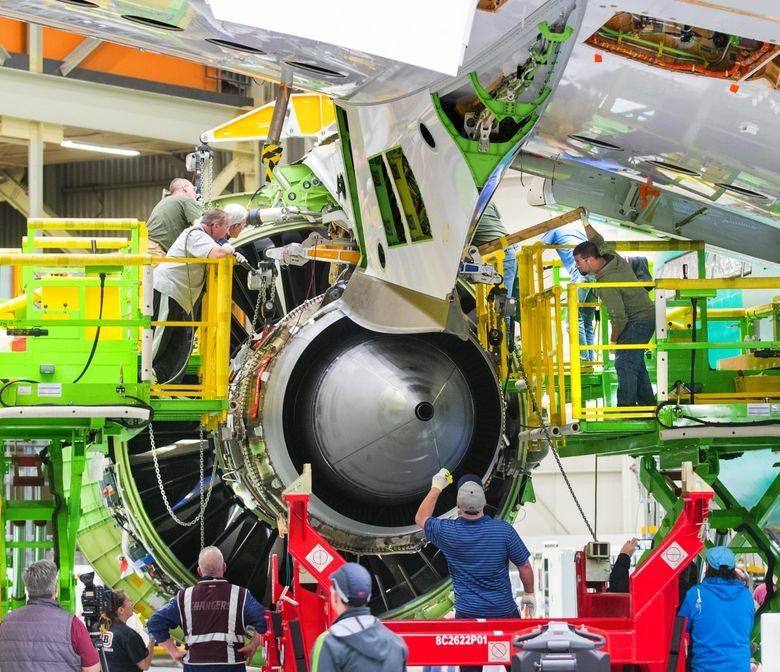 This year, unionized engineers and technical staff represented by the Society of Professional Engineering Employees in Aerospace (SPEEA) will each receive 16.6 days’ extra pay, 166 percent of the 10-day target, out of a maximum 20 days. That’s about 6.4 percent of annual salary. Last year, SPEEA members received a bonus equal to 18.7 days of extra pay, or about 7.2 percent of their annual salary. For nonunion white-collar staff, while overall the total payout will also be 166 percent of target, but the target itself also depends upon an assessment of individual performance by supervisors. For managers, the incentive-plan award is based on individual performance, leadership attributes and business performance. First-level managers will get 1.66 times a target award of 10 percent of salary. Second-level managers have a target of 14 percent of salary and third-level managers 18 percent of salary. Aside from the Machinists’ and managers’ performance plans, the other incentive payouts are based on three financial metrics: revenue, core earnings per share and free cash flow. A Boeing internal presentation on this year’s bonuses, obtained by The Seattle Times, notes that 2018’s record revenue of $101.1 billion was well above the $97 billion target; core earnings per share came in at a record $16.01, well above the $13.90 target; and free cash flow at a record $13.6 billion was well above the $12.8 billion target. The reduction in the size of this year’s incentive payouts compared to last year, despite those record financial results, seems to be because the performance target for each of the metrics was set very high.